Well now you can find out exactly what happened when the boys in black and white played on 7th October. 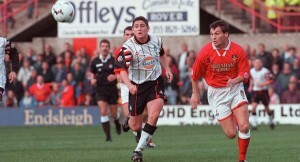 20 years ago on 7 October 1995 – Frank Lampard and Robbie Dennison made their debuts for the Swans in the 2-0 win over Bradford City in front of a Vetch Field crowd of 2,207 in Endsleigh Insurance League Division Two. A Steve Torpey brace gave the Swans a comfortable win, in what was the club’s first game since Frank Burrows resignation. 26 years ago on 7 October 1989 – Ian Evan’s Swans ran out 3-2 winners over Crewe Alexander in Barclays League Division Three at the Vetch Field, thanks to goals from Andy Melville (2) and Tommy Hutchinson. A crowd of just 3,847 witnessed the return of 35 year old Alan Curtis from arch rivals Cardiff City, whom played an instrumental part in setting up all three of the Swans goals. 35 years ago on 7 October 1980 – The Swans put an end to Oldham Athletic’s 5 game unbeaten run with an emphatic 3-0 win at the Vetch Field in front of a crowd of 8,624. 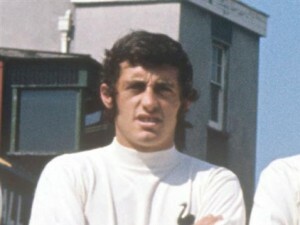 Goals from Alan Waddle and a David Giles brace gave the Swans all the points in this Football League Second Division Fixture. 37 years ago on 7 October 1978 – Mark Baker made his Swans debut as the Swans lost 2-1 at Chesterfield in Football League Division Three. Jeremy Charles had given John Toshack’s Swans the lead before they slipped to their 4th consecutive away defeat of the 1978/79 season. 41 years ago on 07 October 1974 – Mansfield ran out comfortable 3 nil winners over Harry Griffith’s Swans in a Football League Fourth Division game at Field Mill. 43 years ago on 7 October 1972 – The Swans beat Grimsby Town 6-2 in a Football League Third Division game at the Vetch. The 3,071 crowd saw the Swans score more goals in this one game than they had all season to date, thanks to a hat-trick from Geoff Thomas, with the other goals scored by Ronnie Rees, David Gwyther and Brian Evans. I wasn’t at any of these games as I was living away at the time. I was living in Germany when Frank Lampard made his debut. Not surprised at the very poor crowd. I was gutted when Frank Burrows resigned. You just knew we were on a downward slide and only just over a year on from our Autoglass win at Wembley. For Curt’s return I was living in london but I managed to see him play a few times that season before he retired for good.